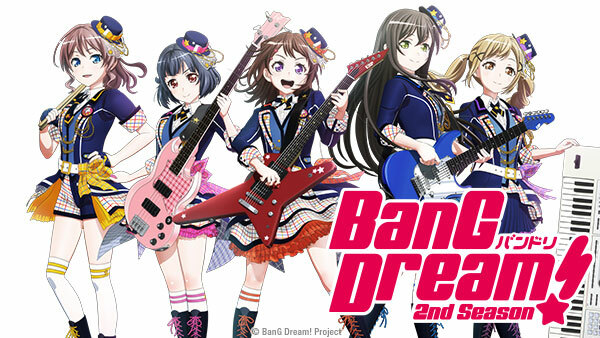 Sign up now to stream BanG Dream! S2, subs, tons of dubs, OVA's, simulcasts, plus the all new Dubcast℠ editions and more! Hina’s proposing a double culture festival between two schools? And it just so happens that PoPiPa’s first anniversary is coming up, too? What a great idea! A new school year begins for Kasumi and the rest of Poppin’Party. But the music scene never rests, and neither do the other bands in town! Rokka learns that Asuka’s sister is in the band she idolizes. Poppin’Party seizes the opportunity when the vocalist of Roselia offers them the chance to perform with them. Poppin’Party reflects on Yukina’s blunt words and decide that improvements are in order. Later, Kasumi and Rokka get to know each other better. E4 | Magnificent! Dynamic!! A Carefree World! Kasumi wants to fly during a performance and Kokoro is determined to help her accomplish this! Nothing can possibly go wrong with this plan, right? Rain or shine, the show must go on — even if it’s raining when Poppin’Party and Afterglow are performing on an outdoor stage! Tae wishes to join another band to help an old friend. She has Kasumi’s full support, but what will this ultimately mean for Poppin’Party? Things appear to be going well… but when was the last time everything went exactly according to plan? Tae wishes to make amends after the fallout from the culture festival. She has a decision to make, but what will RAISE A SUILEN think? The fate of the band hangs in the balance — but no matter how far apart they may be, Poppin’Party are still Poppin’Party. Everyone’s in high spirits cause It’s not over yet! It’s time for Poppin’Party’s first self-sponsored show at Galaxy alongside the other bands.